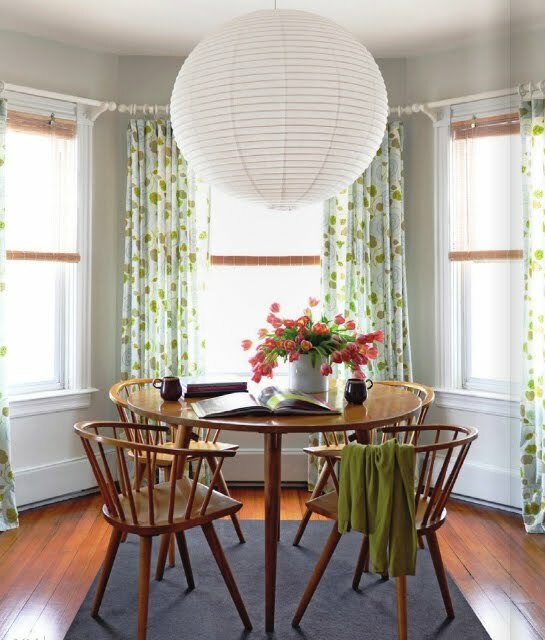 How inspiring are these two dining rooms. I'm hoping to sell our dining set and have been searching for something like these - medium wood tone with a vintage/mid-century look. Our current set has a shiny dark finish and it always attracts our cat's white hair (gross!) and I'm just not a fan of the style. The top image is from an adorable home in rue mag (pg 184) and I think I would move right in if they let me. Love that big oversized lantern. without reading and just seeing your sneak peak via design sponge, totally thought the first photo was your dining room!!! I love that first photo. Heavenly! If only my dining room looked like that... instead of a free-for-all of toys, books and little boy lego! Love both of these. 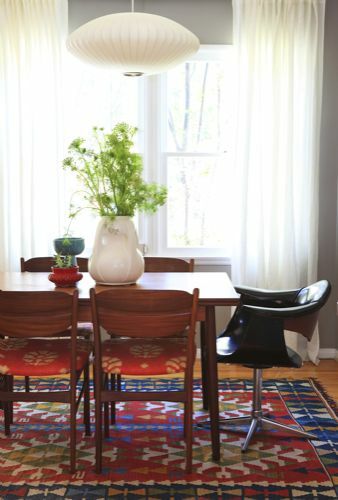 I am on a hunt for two midcentury style chairs for our living room...good luck! That house was my very favorite from the current issue of Rue. The owners nailed the "relaxed & cheery" look, which is precisely what I love. I adore that first dining set so much, simple and cozy! love the huge lantern in the first photo! we have dark, glossy wood furniture in our living room and it definitely shows every speck of dust - drives me nuts! oo those green and white curtains are so loving. the top image is my favorite! it just seems like you would feel as if you were dining in a garden! so pretty! i've been on a midcentury kick lately, too. i'm such a fan of chaise lounges that the eames chaise has really been tickling my fancy. of course, it's a just a touch out of my price range! Love the round table, the coral coloured tulips, the curtains....would love to have breakfast there!